minimal inflammatory cells. Bronchial mucosa and submucosal glands are unremarkable. Alveoli show few pigment laden macrophages. 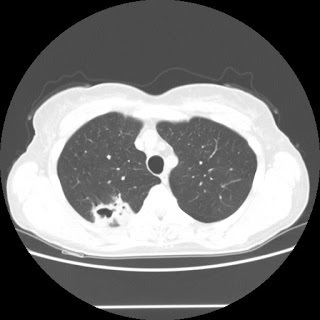 No evidence of granulomas or viral inclusions is seen. AFB stain is ordered, see addendum. What would you do now?? "Pt was extubated per order before mechanic or CPAP gas was up… "
Does this mean the resident gave the order to extubate without know what the blood gasses were? 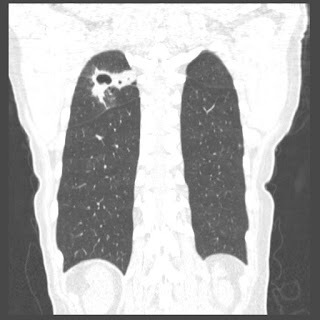 She needs a OLB, this could be cavitary lung cancer. Is it contained or is it growing? Is pt. stable, now or is there worry of further compromise? Contained and stable, I agree, watch it and wait on more diagnostics. Unstable and growing leision, take a more aggressive stance. Have they considered thoracotomy?